Easy English Times appreciates the many contributions of stories and photographs from our readers in the DR Congo. Some stories were featured in our newspaper. The Youth for Peace English Club-Masisi has several goals: to promote and expand English language learning in rural areas in the East part of DR Congo, to promote sustainable culture for peace through activities organized by the club, and to create in young people a spirit of solidarity and peace cohabitation among ethnic groups, through socio-cultural activities. The Youth for Peace English Club-Masisi organized a football (soccer) game of Lushebere English Club against Masisi English Club. For the second time, Lushebere won 1-0. A reception was held. The day included entertainment, games and music. Justin Lwaboshi, YPEC leader, sent in these photographs. He says, "YPEC is promoting English language but is also promoting peace to young people living in this rural area full of armed groups and other challenges." Masisi English Club players are pictured. Second on the left was the referee of the game. The photo was taken as it was about to rain. 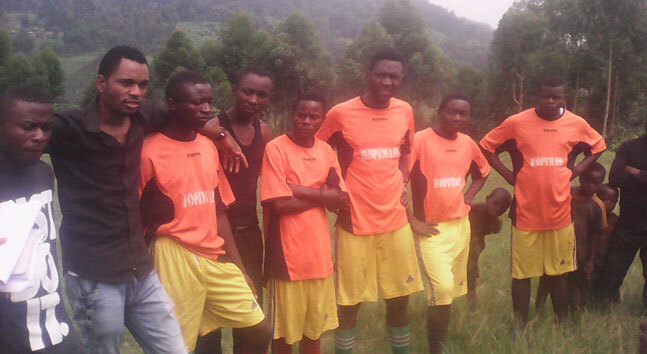 "Our Youth for Peace English Club is located in Masis rural city (85 KM NW of Goma Town), a mountainous zone. It rains almost every day and thus affects mobility on the road because of erosion and landslides," said Justin Lwaboshi. The American Language Center is in the province of Kongo Central in the Democratic Republic of the Congo. John Mabiala Makuedika, pictured back row, left, wearing the hat, sent in this photograph. His favorite sport is soccer. He says he knows how to play the guitar. The group is standing in front of a school. He says there are many difficulties there and that many teenagers and adults can't afford to go to school.